The mission of Fair Ground Community Redevelopment Project is to cultivate a town commons where citizens gather, play and learn, as both stewards and beneficiaries of the land’s agricultural, historical, recreational and environmental gifts. 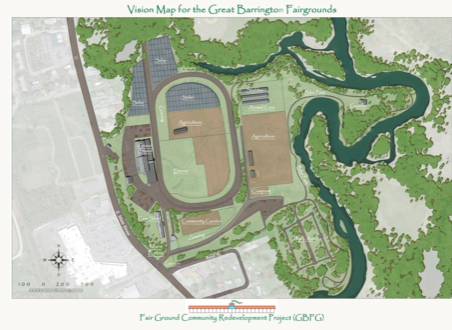 Fair Ground Community Redevelopment Project (GBFG) is a non-profit, volunteer-driven organization which is working to rescue the long-abandoned Fairgrounds site in Great Barrington. In order to make the long-held dream of a revitalized Fairgrounds come true, we need your help. Please consider a generous gift to help us continue to clean up and restore this community treasure. Or give a gift in the name of someone on your list—one present you can be sure will be a perfect fit! Did you know that the plans for the Fairgrounds include a community park, a riverside path, and a community garden? Our community partners include Americorps, Greenagers and Great Barrington Trails & Greenways. Our vision for the site is pictured above. GBFG is a beautiful work in progress! We also welcome you to join one of our many GBFG Committees to be involved in a way that suits your interests and expertise. See all committees and information here.